Dorma's HSW glass sliding wall frontage at the Kempinski Hotel in Dubai. Dorma’s HSW glass sliding wall frontages possess the features of both walls and sliding doors, allowing shopfronts to show off their best side. DORMA, a trusted global partner for premium access solutions and services, has launched state-of-the-art horizontal glass sliding doors on the GCC market. 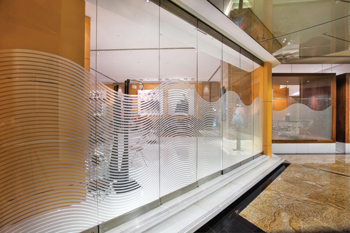 Technically referred to as HSW, the new technology aims to add value to the transparent partition segment with the latest glass door solutions. “HSW glass sliding wall frontages are designed flexibly to cater to a wide range of customer requirements including straight, angled or elegantly curved configurations,” says a spokesman for Dorma. “The main beauty of the system is that floor guides are not required, allowing the use of one flooring material throughout. In addition, virtually any shade and colour combination for the hardware surface is possible – so the system can be perfectly aligned to the corporate guidelines of the customer company within the framework of an integrated façade and interior design solution,” he points out. Precision-made and designed for each individual application, the HSW glass sliding wall frontage is suitable for both renovation and new buildings. The product complies with international standards in all aspects of design, practical scope, seals, thermal insulation or soundproofing, the spokesman states. The system comes with many alternatives in terms of material finish and colour combinations for the visible surfaces, provided in the form of practical cover sections that simply clip into position after system assembly and installation. The HSW glass sliding wall frontage is suitable for both renovation and new buildings. “With the system, shop entrances are able to show off their very best side with an immaculate surface finish right from that all-important opening day,” he proclaims. The HSW/FSW comes in five variants. HSW-G is a fully glazed system with door rails, where the sliding glass frontage forms a continuous, transparent surface – with side frame elements completely absent. The top and bottom glazing rails provide the system with the necessary stability and also contain the auxiliary functional components – all discreetly concealed within the profile. The HSW-GP is another version that is fully glazed with single point fixing, which holds even curved glass panels securely in place. 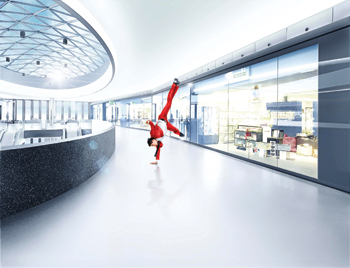 FSW–G and FSW–C are fully glazed with door rails with little to choose between them in terms of their visuals and technology. In the FSW–G version, the door rails are connected at the top and bottom by hinges while in the case of FSW-C, the panels are hung centrally. Similarly, HSW–R is another interesting fully glazed horizontal sliding wall suitable for applications that are likely to encounter high wind loads, such as in the case of large–area shop windows and store entrances that are exposed to the elements. Dorma Gulf is part of the globally active manufacturer of door technology systems and allied products. It entered the Middle Eastern market in the early 1970s and worked towards setting new standards across the industry. In 1997, the company established a regional presence with the opening of Dorma Gulf Door Controls in Jebel Ali, Dubai (UAE). Ten years later, Dorma Gulf built its regional headquarters, which covers an area of around 6,500 sq m at Jebel Ali Free Zone to serve the region’s construction sector and meet the growing demand for innovative technology in door and access systems. Currently, Dorma operates four companies in the region, with branches in eight cities and a total of 320 staff across the Middle East.